I spent years frustrated and annoyed by my own nagging: “brush your teeth”, “put away your school bag”, “get dressed”, “clear your dishes”. I was a broken record, and the more I repeated the requests the slower my children appeared to spring into action. I was driving myself nuts. Then I came across a chapter in “The Secret of Happy Families”, by Bruce Feiler, that was truly a game changer. Feiler shares the story of how one family applied “agile development” and the use of Scrum Boards to become better organized with routine tasks. Agile development, born out of the Japanese auto industry and adopted within tech and design teams, is based on small teams, in this case, a family, who huddle for morning briefings and critique their performance at the end of the week during a review and retrospective meeting. A scrum board is essentially a project task list with a quick overview of the task’s status. A list of project tasks is created and moves in stages across three columns: To Be Done, In Progress, or Completed. A task is assigned an owner, the child, who completes the task. The overall manager of the Scrum Board (and project) is the Scrum Master, the parent. 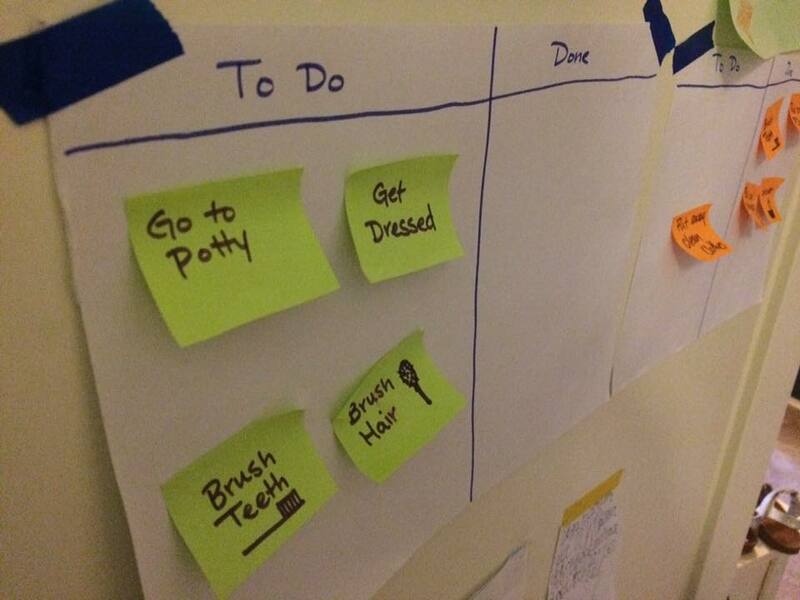 Instead of repeatedly asking your child to complete a routine task or chore consider incorporating a scrum board. Providing a board for your child to oversee and action teaches them how to self-manage the completion of routine tasks, like brushing teeth or putting away their school bag. This will, in turn, empower your child to continue to do more for themselves without you constantly reminding them of what needs to be done. When a child becomes distracted or questions what needs to be done, as Scrum Master, you simply refer to the board to steer them in the right direction. By stepping back you eliminate the need to constantly check-up on their progress. No one likes the nagging and the board provides a visual reminder of what they need to do without your repeated instructions squawking at them like a parrot. I suggest creating individual cards or post-its for each task. Place all tasks on a pin/cork board, A4-sheet of paper or perhaps use your child’s bedroom door. Divide your board into the required columns: To Be Done, In Progress & Completed. For younger children, most tasks take little time and you can omit the In Progress column. For older children who might have a school report or chores that take longer to complete, use the In Progress column. Create different scrum boards for each individual child in the family. Perhaps get them involved in the creation. Consider if you need separate scrum boards for morning and evening routines. For younger school-aged children who aren’t yet reading, use visual images they can recognize instead of words. The concept is simple, your child reviews the tasks that need to be completed, makes their choice and when completed moves the post-it or card from the ‘To Be Done’ to the ‘Completed’ column. Your child then reviews the remaining tasks, selecting the next one to complete, continuing the process until all tasks have made it to the ‘Completed’ column. The parent then reviews that the tasks are completed and resets the task list for the next day. This can be done each evening before bed or in the morning upon waking. I suggest introducing the concept before a series of routine tasks, like getting ready for bed. This is a good time to explain to younger ones that a bath is needed before putting on clean pajamas to ensure certain tasks are completed in their proper order. It is ok if it doesn’t work on the first try. Remember you are introducing something new and there will be an element of adjustment. Allow yourselves a few days to get in the rhythm. Manage expectations and results by discussing how it went. Give them the room to share how they feel. Do this each day, giving praise and pointers on how to achieve better results, such as completing a task in less time. My children embraced the idea readily and for weeks it worked smoothly. Then the tasks became so routine to them they omitted using the boards. We re-introduce the scrum boards from time to time, especially when we get off track during a school holiday break. My mission is to help busy families find more space, focus and time to do the things they love. If you’d like help getting you and your family better-organized contact sorted.by Melissa. This entry was posted in Uncategorized and tagged kids, time by sorted.by Melissa. Bookmark the permalink.